Attached to the Breads on Oak bakery is this beautiful (450sf.) newly renovated studio apartment. (Also see listed our "Bakery House, #403674" for 6-7 guests, with over 40 5-star reviews!). Studio guests receive a welcome of fresh coffee & pastries upon arrival/during their stay. The bakery is open Wednesday thru Sunday for organic artisan breads, coffees, sandwiches, soups, salads & vegan pastries! Bakery Studio is located off New Orleans' famous & fun (yet non-touristy) Oak Street, full of restaurants, music clubs, antique stores and clothing shops. And we're only six blocks from the streetcar line for easy access to the Historic French Quarter, Garden District, Universities, Audubon Zoo and Park, Convention Center and Superdome, and just 1 block from the paved river levee path for miles of walking, running or biking. Although on Oak Street, the studio is tucked away and super quiet. Bakery Studio has just been renovated and is fully furnished and decorated in an industrial elegant style by some of the best artists in New Orleans. Amenities include free WiFi and Cox cable with a large screen tv, easy front-door parking. a gorgeous custom built-in shower, and top-of-the-line appliances. The best part of staying at Bakery House is that you'll be able to wake up to the smell of fresh baked breads from our artisan bakery, Breads on Oak (bakery is open Wednesday through Sunday)! Sean & Chamain bought the building & house in December of 2011 to create a bakery for artisan breads with an attached guesthouse & studio. Sean has been a financial systems consultant, traveling the country to universities and Fortune 100 businesses, but would rather bake bread. Chamain is an artist (paints the Creole Cat) and principal with The BOS Group, a business consulting firm, who loves healthy baking and eating vegan muffins & sweets. Chamain was born and raised in New Orleans, graduating from Tulane in chemistry with an MBA from Emory. While in Atlanta, Chamain met Sean in an Italian Restaurant where they both worked. They married and later moved home to New Orleans while Sean received his MBA from Tulane. That was almost 20 years ago. Sean & Chamain have been married 28 years and have 3 precious rescue kitties at their primary home and 3 at the bakery properties. They love traveling abroad and discovering healthy, new & exotic foods. They both enjoy exercising--Sean likes running and Chamain prefers yoga--but both loves walking on the levee right outside of Bakery House! 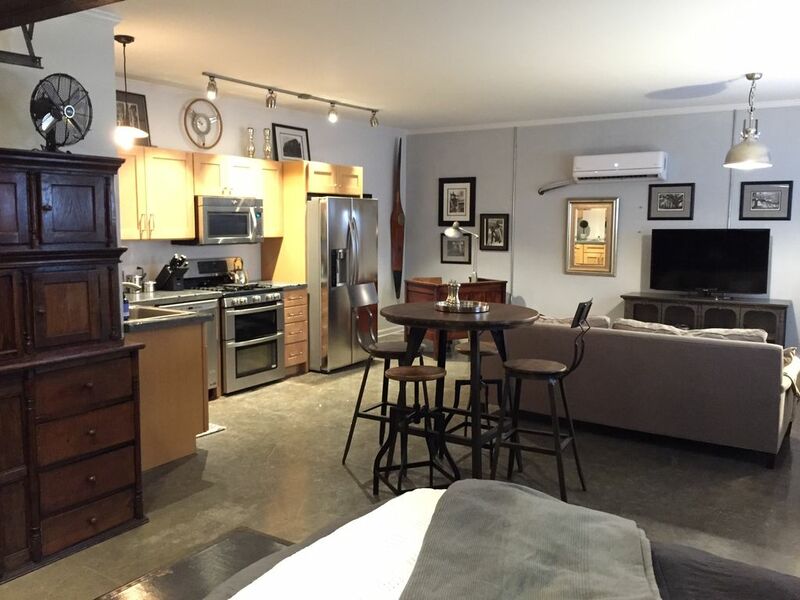 The bakery, studio & guesthouse are 5 minutes from the O'Mahony home, which is right between the airport and the French Quarter--and only a block from the river for biking, running or walking the levee. Oak Street, is the coolest neighborhood in NOLA, too! The Bakery House, which has been listed for 3 years now, has over 40 5-star reviews! We designed this property to have everything we would want for an extended stay with the perfect artistic touches. We love walking Oak Street, with all the fun antique shops, restaurants, coffeehouses, consignment shops and the streetcar line. And the river, where you can walk, bike or run the levee (no cars allowed), is only a block away! The bathroom has a custom tiled step-in shower with marble accents. The toaster is also a part of the oven. The studio is a part of the organic bakery & café, "Breads On Oak." Guests of the Bakery House (also listed, sleeps 6-7) and Bakery Studio, receive a welcome platter of delicious pastries from the bakery upon arrival. The bakery is open Wednesday through Sunday. Loved this place, thanks to Chamain, Sean and all at the bakery for your excellent hospitality. Oak Street is one of the best spots in NOLA and loved getting the streetcar into the city centre every day. Highly recommended! We LOVED this place! It was cozy, clean, and everything we needed was provided! The bakery attached was superb (we recommend the brioche)! The location was convenient as well, just a quick walk to the street car! We highly recommend staying here! Great location. The studio is large with plenty of living space. I appreciated the attention to detail. Great art work. We had a wonderful stay at the 'Breads On Oak' Studio. What a lovely fully appointed home away from home. Charmain and Sean are truly the best. We felt like their personal guests. This was the first time we did not stay in the Quarter in NOLA, what a great experience, so much within walking distance, not to mention the bakery is truly amazing. We hope Charmain and Sean visit us in the Midwest and bring their delicious bread and goodies. I had an 8 day stay here, The owners and the bakery staff are very friendly & helpful.The studio is in a perfect location, has everything you may need and it's very comfortable, My only complaint was I wish it was cleaned better. I will definitely be back to give it another try. Attached to Bakery House is our artisan bakery & cafe, with organic breads, pastries, sandwiches & soups. And within blocks are funky bars, restaurants, coffeeshops & antique shops, walking & biking path along the Mississippi River, Streetcar rides to the French Quarter. There's also Hollygrove Market for fresh produce and other goodies open every day. We also have listed a 3 bedroom property, called "Bakery House."